Minnesota leaders are starting work on a $2 billion light rail project, the state’s largest infrastructure project — and the kind of spending that may help keep recession risk at bay. States and municipalities contributed 0.22 percentage point to annualized growth in the third quarter, the most in two and a half years, Commerce Department data show. 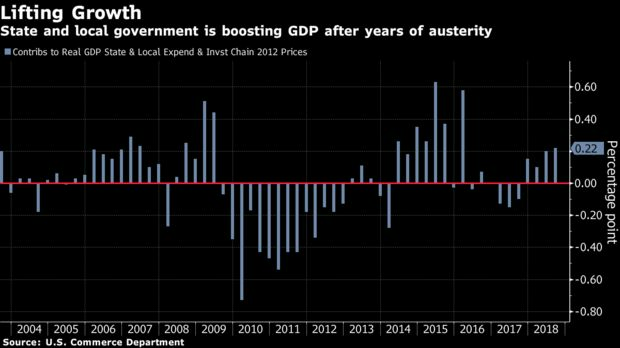 State and local spending will add as much as 0.3 percentage point to growth in 2019 and the first half of 2020, estimates Neil Dutta, head of U.S. economics at Renaissance Macro Research LLC. A strong economy with rising employment and robust consumer spending is boosting government coffers, funded mostly by sales, income and property taxes. Unlike the federal government, which passed a $1.5 trillion tax overhaul and $300 billion spending boost, most state and local budgets must be balanced, including maintaining rainy-day funds. U.S. states took in 5.5 percent more tax revenue from July 2017 through June 2018, the budget year most use, than in the previous year, after adjusting for inflation, according to a report from the Pew Charitable Trusts. It was the greatest increase since fiscal 2011, with gains in 48 of 50 states. Still, former Federal Reserve Chairman Ben Bernanke has warned of a “Wile E. Coyote” cliff effect as fiscal policy tightens after 2019. Ray Dalio, founder of Bridgewater Associates, the world’s biggest hedge fund, predicted in September the economy is two years from a downturn. A recent Bloomberg survey showed economists raised the probability of a recession in the next 12 months to 25 percent, the highest in more than six years. Two-thirds of business economists in the U.S. expect a recession to begin by the end of 2020, according to a poll released Oct. 1 by the National Association for Business Economics. While the five-week shutdown ended and congressional leaders negotiating to avoid another, fiscal deficits are set to widen, and stimulus spending “is projected to diminish significantly by the end of 2019,” according to a new Congressional Budget Office forecast. State tax revenues soared 8.8 percent in 2018’s first half, boosted by more than 10 percent gains in individual income taxes, Urban-Brookings Tax Policy Center data show. Local property tax revenue rose an average of 2.1 percent as people prepaid property taxes in the prior fourth quarter to take advantage of tax law changes. “Revenue growth is finally accelerating in earnest,” said Moody’s Analytics Chief Economist Mark Zandi. The Fed has noted state and local spending has been supporting growth, even as its leaders have called for patience in raising rates in the face of growing headwinds. Fed staff cited purchases by state and local governments was “edging up” amid a solid rise in construction spending, according to minutes of the Federal Open Market Committee’s Dec. 18-19 meeting. The Minnesota rail project, a 14.5 mile extension linking Minneapolis and five southwestern suburbs, is scheduled to begin service in 2023. Improving roads and bridges was a top issue in the campaign for governor, with newly elected Tim Walz, a Democrat, pushing to raise the state’s gas tax and using it to create a dedicated funding source for such improvements. “Even with everything we’ve done, our infrastructure is in real need of investment,” said Lucas Franco, a research manager for North Dakota and Minnesota for the Laborers’ International Union of North America. “Our roads are just horrible,” said Michigan League for Public Policy President Gilda Jacobs, who said she’s lost windshields to errant debris on crumbling streets and bridges. Investment spending appears poised to hold up. Voters across the U.S. approved about $53 billion of state and local bond measures in the November election, according to market researcher Ipreo by IHS Markit.